Can you believe ‘Origami Organs’ could be the future of regenerative medicine? Can you believe discarded animal organs can be turned into ‘origami organs’? No it is not an art project. A team of researchers at Northwestern University created the paper cranes to demonstrate the flexibility and malleability of their latest breakthrough: a “tissue paper” that has the potential to heal wounds, prevent scarring and help hormone production in cancer patients. The “tissue paper” is a blend of proteins from animal organs that, when wet, can be folded, rolled, cut, flattened, balled, ripped and even crafted into tiny birds. It can also be frozen for later use, making it even more practical. And as with many scientific discoveries, the team at Northwestern stumbled upon the new material as an accident. The scientists were researching 3D-printed mice ovaries when one of the team members spilled the hydrogel-based gelatin ink used in creating the ovaries. The ink pooled into a dry sheet that ended up being surprisingly strong. Since then, the researchers have been collecting scrap pig and cow organs from a local butcher and using them to further test out the regenerative tissue paper. Breaking down everything from animal uteruses to kidneys to muscles to hearts, the team extracts the structural proteins – which give an organ its form – then dries them out and combines it with a polymer, or resin, which generates the thin, paper structure. 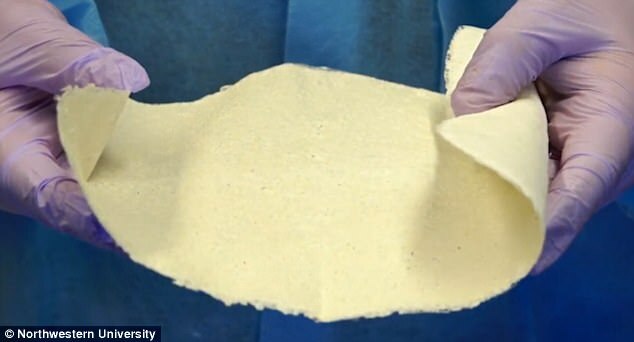 The final product is basically a papier-mâché-like sheet of proteins that can retain the biochemicals needed to regenerate a sick or injured piece of tissue, like a human liver, or skin laceration. Though a lot more research is needed, the material could one day be used to accelerate healing after surgery and help treat hormone deficiencies in cancer patients. The researchers also found it can support human stem cell growth.